There is an old saying in the South, “The Good Lord willing and the Creeks don’t rise.” The phrase has nothing to do with running streams, but instead is a flashback to the days of the Creek War of 1813-1814 and, particularly, the Red Stick attack on Fort Mims, Alabama. Fort Mims was a rough log stockade constructed in 1813 around the home of Samuel Mims, an early settler of Baldwin County, Alabama. The powerful Upper Creeks of Central Alabama were not particularly hostile towards Mims and his neighbors. Many, in fact, were related to the early settlers and Creek warriors often traded with and visited Mims and other residents of the Tensaw settlements. This “live and let live” attitude changed, however, when a civil war broke out in the Creek Nation. On one side were the Red Sticks, followers of a nativistic religion taught by the Alabama Prophet Josiah Francis. They believed in a return to native ways and a rejection of white society and culture. Opposing them were the principal leaders of the nation, including the Big Warrior, who lived very much according to the white plan of “civilization” for the Creeks. 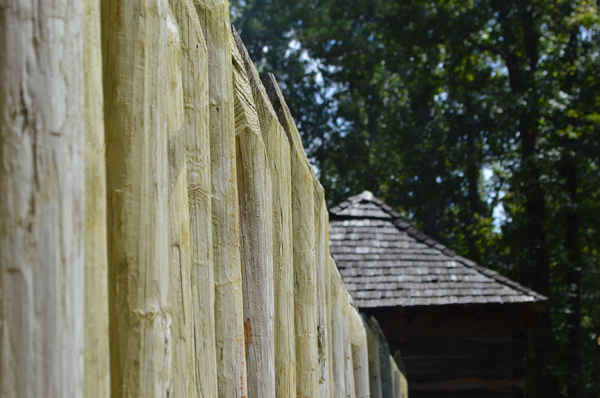 The restored log wall and blockhouse of Fort Mims. Hundreds of Red Stick warriors, led by the famed Creek warrior William Weatherford, suddenly stormed from the woods surrounding the fort and rushed the open gate and walls. The alarm was spread and the men of the fort grabbed their weapons and rushed to beat back the attack. Major Daniel Beasley, the commander of the fort, was killed as he tried to close the gate. The battle raged throughout the afternoon. Despite their initial surprise, the occupants of the fort fought bravely, as did the Red Stick attackers. Finally, however, Fort Mims fell. The exact number of people killed in the attack is subject to some debate. Estimates range from around 250 to more than 550. The same is true of Red Stick losses, estimates for which range from around 100 to more than 300. Although the attack on Fort Mims was a retaliatory strike for the white attack on the Red Sticks at Burnt Corn Creek, it was considered an outrage by the people of Georgia, Tennessee and the Mississippi Territory. Three armies soon converged on the Creek Nation and the Red Stick forces were finally cornered and defeated by Andrew Jackson at the Battle of Horseshoe Bend the following year. Fort Mims is now a state historic site. The five-acre site is located 4.4 miles west of SR 59 at Tensaw. Travel west on Boatyard Road (CR 80) to Fort Mims Road and turn right. The site will be just ahead on your right. The address is 1813 Fort Mims Rd, Stockton, Alabama. Please see the map at the bottom of this page for directions. Fort Mims is free to visit. In addition to the restored log walls, the site includes monuments, interpretive signs, a restored blockhouse, and picnic tables. The annual reenactment and living history event takes place each August. 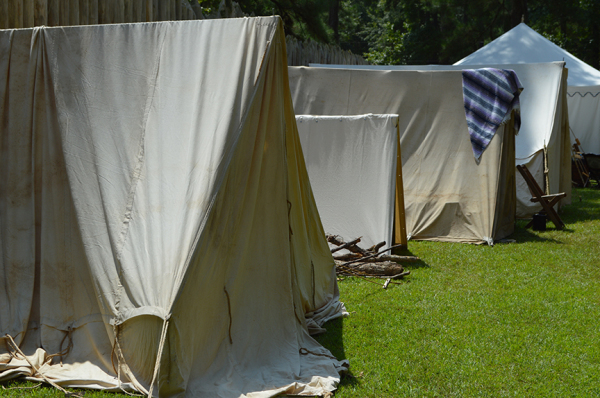 Tents crowd the interior of Fort Mims during the annual reenactment. The war did not immediately threaten white settlements around the fringes of the nation. In fact, it was an action by the settlers themselves that brought the war to their own doorsteps. In July of 1813, a rough and tumble band of territorial militia attacked a Red Stick supply train at Burnt Corn reek, Alabama. Blood was drawn and the families of the killed and wounded Red Sticks swore vengeance on their white neighbors. That vengeance came on August 30, 1813, when Red Stick warriors attacked a woefully unprepared Fort Mims. Hundreds of men, women, and children had gone to the fort for safety after the debacle at Burnt Corn Creek. By the time the battle was over, more than 250 of them were dead. The Battle of Fort Mims, also known as the Fort Mims Massacre, began as the people of the fort were gathering for their noon meal. The main gates of the fort were open and there was a general lack of concern about the possibility of an attack.